This little thang is a perfect harmonica gift. Fantastic value too! It isn’t a toy, it really plays, and because of its size it can go anywhere. Just like the full size harmonicas it has a plastic comb, metal reeds and metal cover plate. Also supplied is a chain so you can hand round your neck if you choose. 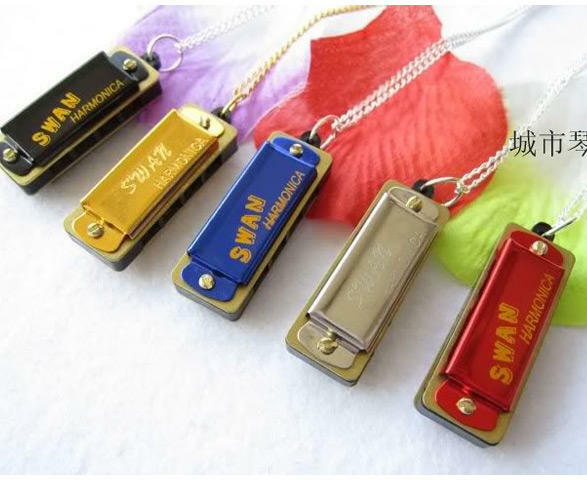 In the key of C, the usual best harmonica key for a beginner, this Swan mini has four holes covering one full octave. Rockin’. Definitely a harmonica gift to buy that special someone who thinks they already have everything........or just buy one for yourself! Perfect stocking filler or harmonica gift for the player who thought they had everything.